The ancient Aztec warriors wore armour, but not as much as you would think. The need for armour still existed in Mesoamerica but the climate, weather, and the type of weapons used were also factors that affected the choice of armour used by the Aztec warriors. Aztec armour use was minimal, and was essentially fabric and animal hide based. Metal armour was not used as the Aztec metal workers only used copper, gold and silver, and none were truly suitable for the use of armour or weapons. Instead the Aztec used lightweight materials to fashion their protection for the battlefield, allowing them to stay light on their feet. In the warm and tropical climate of the valley of Mexico, fighting in heavy armour would have put extensive strain on the body, and likely would have caused exhaustion or heatstroke. The Aztec warriors knew this and preferred to keep their armour light to ensure they would keep a reserve of energy. Ichcahuipilli was the common armour in Aztec times, a lightweight fabric armour that was easy to construct from the materials the Atzecs had readily to hand. The ichcahuipilli armour would have been made from a mix of cotton and a naturally growing fibre to the gulf of Mexico, known as Jute. The Aztecs would blend layers of both materials and stitch them together to produce a laminate effect offering protection but also allowing heat to escape from the body. The word ichcahuipilli in Nahuatl broken down into lchcatl which means cotton, and huipilli which means shirt. A low ranking Aztec Warrior wearing padded cotton or hemp armour. The ichcahuipilli was designed with the heat of the Aztec land in mind, and also the weapons common to the area. Arrows, obsidian bladed weapons and blunt force weapons were the typical choices in the Gulf of Mexico, and ichcahuipilli offered good protection against all three. The Aztec war suit, the tlahuiztli was unique to the warrior depending on rank. As an Aztec warrior rose through the military it would become more and more flamboyant. A good example of how a tlahuiztli can be customised is with the Eagle and Jaguar warriors who would adorn theirs with eagle feathers or jaguar and animal hide. The tlahuiztli was a full body suit that contained both legs and both arms, it would offer basic protection to these limbs when in combat. Its likely the tlahuiztli was made from a cotton or linen fabric, not to heavy or dense to ensure it didn’t retain too much body heat. The tlahuiztli was worn over the top of ichcahuipilli which would be their primary defence layer. Of course not every Aztec warrior would be adorned with a tlahuiztli, they were often reserved for the noble Aztecs or the elite warriors. The Aztec helmets, known as cuacalalatli in classic Nahuatl, was the Aztec method of protecting the head from serious injuries in battle. The cuacalalatli were typically constructed primarily from local wood, and covered a large portion of a warriors head and jawline. It’s thought that the carving techniques the Aztecs used for these wooden helmets dates back to some of their ancestor tribes. These helmets were not used by everyday warriors, and were typically reserved for high ranking, highly decorated or noble Aztec warriors. The helmets were common in the special orders, the Eagle and Jaguar warriors for example had highly decorative helmets that represented the animal from their warrior class. There were plenty of shields used by the various Aztec warriors, some were lightweight in design, easy to carry and wield and some were made from solid wood, much heavier but also offering more protection to the bearer. It was also common for more elite Aztec warriors to have their shields tailed with leather strips. These leather strips would add additional protection to the legs or body when in battle, depending on the height of the shield at the time. The primary Aztec shield was known as the cuauhchimalli in classic Nahualtl and was a circular shield roughly 1/4 of the height of an Aztec warrior. The cuauhchimalli was made of wood, yet would be adorned with paint, designs or feathers. 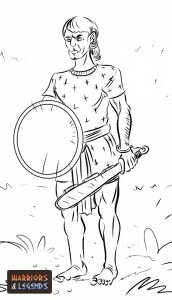 the otlachimalli shield was made from cane woven together with a cotton backing laid on. Once constructed the shield would be decorated with paint, covered with animal hide or decorated with feathers. The pamitl was a back banner that various Aztec warriors wore into battle. The classical Nahuatl translation from pamitl is ‘flag’ which accurately describes its use on the battlefield. The Aztecs used these flags to quickly locate where certain warriors were on the battlefield, which each flag or set of flags having a unique pattern, decoration or style. Due to the warrior wearing their pamitl on their back, the back brace and construction was lightweight, they would likely have used some type of lightweight cane to ensure they didn’t lose their step in combat. The Aztecs loved decoration, and their armour was treated no differently. The Aztec were a creative civilisation and their belief in their gods and religion shaped much of their decoration and their source of inspiration. Colours used in the Aztec designs were common, green, red, yellow and orange, and feathers were incredibly popular also, as decorative items. Perfectly suited to their environment, the hot and sweaty jungle environment, the Aztec warriors would adorn their light armour with beautiful colour, design and patterns. If you worked hard in the military, chances are you might become a might warrior and one day have your own armour.